Would you like to live in one of the most peaceful parts of Brno during your month-long or even year-long stay? 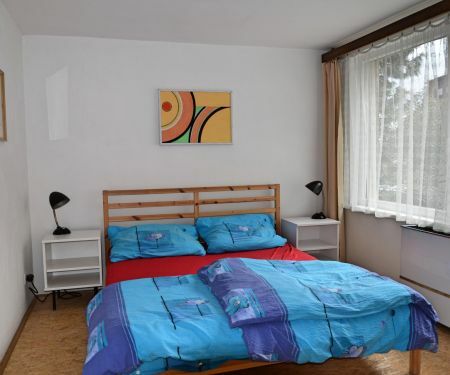 At Flatio, you can easily find a short-term or medium-term rental in Brno-Jundrov. You can clearly see all the currently available rental apartments in Brno-Jundrov on the map we have prepared for you, along with basic information about each of the offers in this serene location. Finding a rental in Brno-Jundrov is the dream of every person who needs to stay in the city for a while but prefers peace and quiet over the urban hustle and bustle. Don’t let any great deals pass you by and watch out for the most recently added offers of rental apartments on Flatio. Afterwards, you only need to look through their accompanying virtual tours, and if one of them enchants you, ask for a reservation of the rental in question. Finding accommodation for a few weeks or even months which will suit all your needs and tastes could not be easier. Enjoy Brno in your own way and don’t settle for anything less. Choose Flatio’s short-term or medium-term apartment rentals! Be smart and find accommodation in Brno for 14 days, half a year or even 12 months at a reasonable price. No more expensive hotels or real estate agencies, choose Flatio instead and get a rental in Brno-Jundrov without a real estate agency or high commission fees. Why throw your money away and into the pockets of real estate agents when you can save it for your upcoming stay in Brno instead? Explore the short-term, medium-term or long-term rentals on offer on Flatio and avoid any unnecessary fees. A year-long apartment rental in Brno-Jundrov without deposit? On Flatio it‘s not a dream, but a reality, so take advantage of this offer and reserve your accommodation for the entire duration of your visit to Brno.